If you want to succeed as an entrepreneur, you need to solve a problem or fulfill a need — even if it's one consumers didn't know they had. From faux-handwritten thank-you notes to a Tinder-like app for rescuing pets, these 15 unique businesses are sure to inspire. Many consumers are concerned about how much resources are wasted in the food packaging process. Often, cardboard, plastic, Styrofoam and twist ties are not recycled, leading to environmental waste. In.gredients in Austin, Texas, solves this problem by offering container-less shopping for locally-sourced, sustainable, organic foods. The company claims to divert 99 percent of materials from the landfills and has produced zero food waste since 2012. In.gredients also offers personal care items and hosts events in its beer garden. Believe it or not, many companies, such asArtful Ashes, create glass art using the ashes of deceased loved ones. This memorial business has been operating since 2012 and offers mourning customers a way to remember their lost loved ones or pets. Using just a tablespoon of ashes, you can order glass art in the form of hearts, spheres or pendants. Each piece is hand-created in Seattle, Washington. Death, though not a popular topic, is inevitable, so businesses like this will never run out of customers. Stinky sponges are disgusting. Folcroft, Pennsylvania-based Scrub Daddy solves this problem with a scratch-free, non-smelling sponge. This company had a rocky start when it was formed in 2012, but since their 2014 Shark Tank appearance and the assistance of Lori Griener the business has really taken off. Now you can find Scrub Daddy's products in big box stores such as Bed, Bath and Beyond, Lowes and Walmart. Located in the heart of the Napa Valley, Thomas Keller's Ad Hoc offers a unique, four-course daily menu of comfort food dishes, such as spicy fried game hen, pot roast and coconut pudding. Each for-today-only menu is handwritten and posted in the restaurant and online. This popular eatery has been open since 2006. Manhattan's Lunchspread takes everyone's love for free food in the office and adds a genius marketing strategy for local restaurants. This company helps new and under-the-radar restaurants build up their customer bases by matching businesses in the area to food they're likely to enjoy, and delivering free samples right to those businesses' doors. After the samples are delivered, the recipient group fills out a survey about the food. Then, Lunchspread schedules you for another surprise sample delivery. Each delivery comes with coupons and a card full of details about the restaurant. That way, you can learn more about where your food came from and reorder from the restaurant if you and your employees enjoyed the meal. Every day, technology makes it more and more possible for employees and entrepreneurs to do their jobs and run their businesses from anywhere, which means businesses don't necessarily have to invest in their own office space. WeWork provides office space for the office-less, with flexible month-to-month membership options for everyone from individual freelancers to large companies. Freelancers who prefer to work outside of their homes can have a more reliable work space than a local coffee shop, and companies and other teams can have a place to collaborate and hold meetings and events, for example. WeWork, which was founded in 2010, has locations in more than a dozen cities across the United States as well as locations in Israel, the Netherlands and the United Kingdom. The company also fosters a sense of community among its members, so you can network with peers and customers while saving money on rent and other fees that come with maintaining your own office space. Borrowing a page from popular dating app Tinder, BarkBuddy makes it easy to find and adopt the perfect dog for you. Users tell BarkBuddy what they're looking for in the perfect pup, and then swipe yes or no on different profiles of dogs in their area. Once you've found the right dog, you can set up a meet and greet through the app. The company ensures that everyone using the app is qualified to adopt, too. You have to fill out an adopter profile to be approved first; otherwise, you won't be eligible to adopt. Do you ever find yourself wishing you could go back to school, or maybe even teach a course in a subject you're skilled in? Skillshare, founded in 2011, makes both of these things possible. The company allows experts to teach online courses on any subject they choose via short videos, while students can watch classes at their own pace and use the community to get feedback. Students can even take classes off-line via smartphones and tablets if they'd like to learn on the go. And unlike college or graduate school, with their high tuition rates, Skillshare costs a small fee of $10 per month, with a free 14-day trial. Half of that fee goes toward paying the company's teachers, so if you're an expert at something, it's a great way to make some extra money, too. Skillshare also gives back; according to the company's website, for every annual membership purchased, Skillshare gives a membership to a student through the company's scholarship program. Being pregnant can be a physically and mentally exhausting nine months for many women. Hoping to make pregnancy a little easier, Stephanie D. Johnson founded Bed Rest Concierge. The business provides a wide variety of pre- and post-delivery services, including creating and managing a baby registry, birth announcement creating and distribution, nursery design, diaper delivery service, laundry service and hospital preparation. In addition, Bed Rest Concierge offers a number of "pampering services," such as manicures, pedicures and facials. While bigger might be better for some, Minimustakes a different approach. In operation for nearly a decade, the online company offers more than 2,500 different individually packaged products, including travel-size toiletries and individual servings of various food items — everything from chips to Tabasco sauce. When it was founded, Minimus did not have any employees and was housed in 500-square-foot space. Today, the company takes up two large Los Angeles warehouses and employs dozens of workers. In addition to the individual items, Minimus sells premade kits specially designed for different uses, such as baby and family kits, outdoor kits, first-aid kits and military care packages. Saying thank you has never been easier with the help of Thankster. The online business lets users easily create personalized thank-you cards with simulated, authentic-looking handwriting. The service gives users the ability to pick and choose from a variety of handwriting styles in order to best match their own. For consumers, Thankster is great for sending thank-you cards for weddings, bar mitzvahs, graduations and baby or bridal showers. Many businesses use the service to send personalized "handwritten" notes to valued clients, customers, partners and employees. After the notes are finished, Thankster stuffs, stamps and sends out the letters to their intended recipients. While chartered boat cruises are not unique, the opportunity to rent out a world-class racing sailboat for your own use is. Based in Rhode Island, America's Cup Charters rents out some of the country's most prestigious racing sailboats for company outings, team-building events and family gatherings. During the outings, guests experience what it's like to be an America's Cup sailor by learning tasks like how to jockey for position at the start and sail upwind and downwind. Included in the fleet of ships are the 1962 America's Cup winner US-17 Weatherly, two-time America's Cup winner US-22 Intrepid and the 1980 America's Cup winner US-30 Freedom. Founded by George Hill and Herb Marshall, the company offers the only fleet of actual America's Cup Defenders available for charter in United States. For some events, the typical green and cramped portable toilet just won't do. ElizaJ rents out high-quality, clean and attractive portable restrooms for any outdoor event. Each of ElizaJ's individual restrooms includes fresh flowers, designer soaps and lotions, name-brand paper products, wicker waste baskets, air fresheners and fresh water. The company recently unveiled its newest restroom, "The Powder Room," which can accommodate events of up to 350 people and is designed to rival restrooms in the finest restaurants and department stores. ElizaJ has also launched a franchising model to give other entrepreneurs the opportunity to run their own portable restroom operation. Kids who grew up wanting to design their own version of Monopoly or Clue can easily do so now with the help of The Game Crafter. The world’s first web-to-print game publishing company givers gamers the chance to create their own custom board or card games. While designing and publishing a game used to be extremely difficult, The Game Crafter, founded in 2009 by JT Smith, Tavis Parker and Jamie Vrbsky, has simplified the process by providing templates, instructions, videos and proofing tools to help would-be game designers create a quality product. Users then have the option of buying as many copies of the game as they like. Design A Tea offers consumers the ability to design their own tea blend from scratch. Founded in 2007 by J. Brian Pfeiffer, the online business lets tea drinkers choose from among more than 40 flavors that can be mixed and matched to create their own artisan tea blend. Shoppers first select a base flavor — black, oolong, green or rooibos — and then mix in two other ingredients, such as almond, Irish crème, passion fruit, rum or wintergreen. In total, there are more than 10,000 different combinations tea drinkers can create. As part of its mission, Design a Tea has adopted numerous socially responsible practices, including using recycled paper products, labels and environmentally friendly inks. All of their tea flavors are 100 percent natural, organic and gluten-free. There is a list of 100 business ideas. In addition to that, there is a tool to help you begin planning your own business - all on this one app!! Wow! That's amazing! 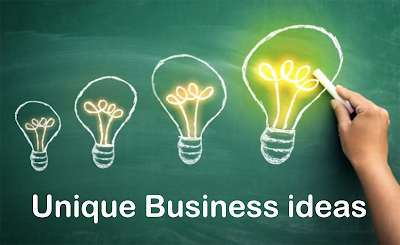 You people have shared so many innovative business ideas for startups. They are so meaningful and also are in budget. I have also did a startup and I had got Business Solutions for my small business from Synergy 360 which are prove so helpful for my business and I still connect with them.